The nature of the way we spend our Sundays has changed dramatically from the days of shops, pubs and other businesses being shut tight for the Sabbath. Our habits have changed accordingly and it’s usual to see the cities as just another working day these days. I personally have mixed views about this. Having been a former shift worker for many years and required to work on a Sunday whether I wanted to or not it always felt ‘wrong’ to me, if not just for general religious beliefs but for the fact that was the way I was brought up as a youngster and equally as importantly for many early years in the workplace I worked Monday to Friday only. The weekend was for me. All mine. These days I like my Sunday just as it is. It will contain a run at some point, maybe a bit of gardening if the weather is suitable, a country walk or just relaxing at home like millions of others do. 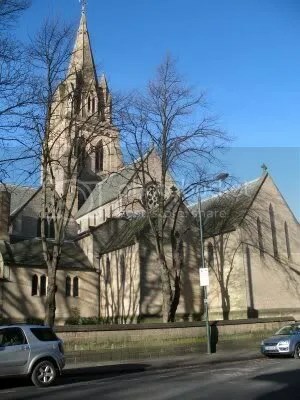 Finally on a Sunday evening at 6pm my custom is to attend Mass at Saint Barnabas RC Cathedral in the city of Nottingham. As is also customary I tend to leave precious spare time to arrive at Mass and am usually to be found rushing on my way there. It’s my most important rush of the week as I really don’t enjoy the feeling of walking in there late. It’s a little foible of mine and I always make a real effort to to get to the cathedral that important few minutes early to spend in a little reflection and ready myself for the service. I enjoy it more that way. Yesterday evening saw my usual hasty drive into the city. Parking up speedily I walked briskly round to the main Derby Road entrance of Saint Barnabas. On the pavement in front of me were a young family, peering behind them at something that had taken their interest, one child pointing something out to his mother. Looking behind a man, perhaps in his thirties looked like he’d spent his whole Sunday in a completely different way. He was lying flat out on his back on the pavement perhaps a hundred yards back, apparently comatose and certainly helplessly drunk. Speeding on, I made for the cathedral doorway only to look around again and see him half-staggering to his feet, waving at no one in particular, the cars on the busy main arterial road flashing past him at some speed. Another drunk. All-day drinking. What an idiot getting in a state like that – these were some of my immediate thought, without being sniffy or pious about it as I certainly a enjoy a pint or two myself. I passed through the entrance and Mass began shortly afterwards. Sitting there I began to compose a dilemma in my mind that I’d not thought of in my rush to get there. The man out on the street was there by his own doing – he drank himself into such a dangerous state – presumably by his own doing. Thinking on though he was in some danger and could easily have got himself seriously injured or even killed had he fallen into the road beside him. The long and short of it is I felt I should have done something to help him but in my haste to be where I wanted to be, doing my own personal thing, I did nothing. I began to wish I’d not entered the cathedral and instead hauled him away somewhere safe or at least tried to rather than walk into Mass. As stated previously, it would have been a case of doing one thing or another, I don’t go into Mass late, ever. What would you have done? Mass or Miss? I don’t know. People who are drunk can be very unpredictable and I think I would have been a bit scared. But the other thing is that once we are in a quiet place-like at Mass it is much easier to think clearly and see what either we could have done or maybe should have done, whereas at the time the decision is so quick we are not focused well enough. I know what you mean. He looked pretty helpless though. I’m a big lad and can look after myself okay, but I take your point – you just never know in this day and age. I guess we can all look back and think ‘should have done this/that’ in retrospect. There was no sign of him later and importantly no sign of any commotion outside. I’m hoping and praying that he got home safely and that he doesn’t put himself in such danger another time. Does your Parish have a catholic charity such as St. Vincent de Paul? Does your area have a homeless shelter or soup kitchen of some kind? I have worked with the homeless and while there is an element of danger I have been lucky in that noone has attacked me. The sad thing here is that many are Vietnam Veterans:(and also there are lads who leave home because of unstable homelife, very sad:(. It may be an idea to have a person in your parish who is in contact with other agencies who deal with homeless and those on the fringes of society. Just a thought:). If we are not here to serve the poor, the down trodden and the rejected..what are we here for? Thanks for your comments Marie. Interesting to hear of your experiences working with the homeless. On this particular occasion, the fellow didn’t perhaps look like a homeless person, but rather just someone who was helpless with drink after completely overdoing it. Many thanks for your lovely site. It is always uplifting and completely inspirational.